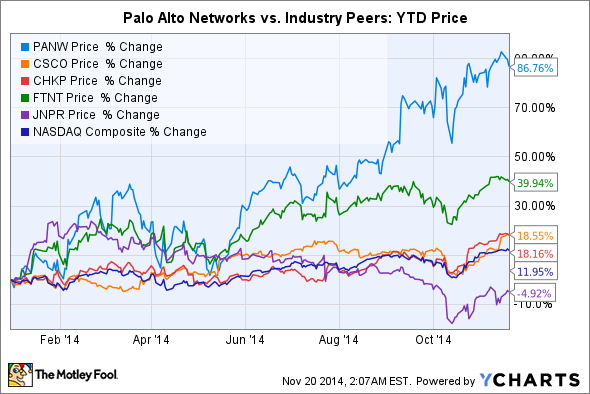 Does Palo Alto Networks still have room to run after its impressive yearlong rally? Palo Alto Networks' (NYSE:PANW) stock has soared 87% in 2014, easily outperforming its industry peers and the overall market. What fueled that massive rally, and will the stock keep climbing in 2015? Palo Alto Networks' cybersecurity business has been booming because of the increase in data breaches worldwide. As of Nov. 18, the Identity Theft Resource Center had identified 679 breaches in 2014, which exposed over 81.3 million personal records across the government, education, business, banking, and healthcare sectors. That's a big jump from 614 breaches in 2013, 470 in 2012, and 419 in 2011. High-profile data breaches -- like the ones that hit Adobe, Target, JPMorgan Chase, and eBay -- can seriously damage a company's business and reputation. Because of stronger demand for better security solutions, Gartner expects worldwide spending on information protection to rise by 7.9% year over year to $71.1 billion in 2014, then climb to $76.9 billion in 2015. In addition to data breaches, relaxed bring-your-own-device policies and larger data transfers will respectively increase the need for better mobile security and data loss solutions. Palo Alto competes against four bigger rivals: Cisco (NASDAQ:CSCO), Check Point Software (NASDAQ:CHKP), Fortinet (NASDAQ:FTNT), and Juniper (NYSE:JNPR). At the end of 2013, IDC reported that Cisco controlled 18.1% of the security appliance market, followed by Check Point's 12.7%, Fortinet's 6.6%, Juniper's 6.4%, and Palo Alto's 5.4%. 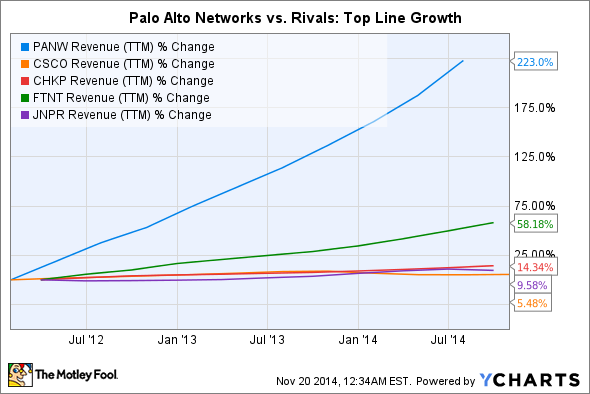 However, Palo Alto's top line has grown at a much faster rate than all four competitors since its July 2012 IPO. Last quarter, Palo Alto's revenue rose 59% year over year to $178.2 million. By comparison, Check Point's top line grew 8% and Fortinet's rose by 25%. Cisco and Juniper, which both have more diversified networking businesses, respectively reported 1.3% revenue growth and a 5% decline in their most recent quarters. Palo Alto's revenue is split between product and services. Its products include firewall appliances, which shield companies' networks from attacks, and central systems for maintaining the deployed appliances. Services revenue comes from subscription, support, and maintenance fees for those products. In its recently ended fiscal 2014, Palo Alto's product revenue rose 39.6% while services revenue climbed 69.3%. Products accounted for 56.9% of the company's top line, while services accounted for the other 43.1%. While Palo Alto's top-line growth is robust, its bottom line looks flaky. The company hasn't posted a generally accepted accounting principles-adjusted profit since its IPO. Its total operating expenses soared 114% year over year in fiscal 2014 to $654 million, or 109% of its revenue. That increase was partially due to legal settlements with Juniper and Fortinet, which cost a combined $141.2 million. Palo Alto acknowledged that its larger competitors "have substantially broader and more diverse product offerings" that could impact its market share if those companies use "zero or negative margins, product bundling, or closed technology platforms." That's exactly what Cisco has been doing -- sacrificing margins for market share by selling "security bundles" at a lower cost than its smaller competitors. To marginalize its competitors, Cisco will keep selling cheaper security bundles with more bells and whistles, forcing Palo Alto, Check Point, and Fortinet to do the same. 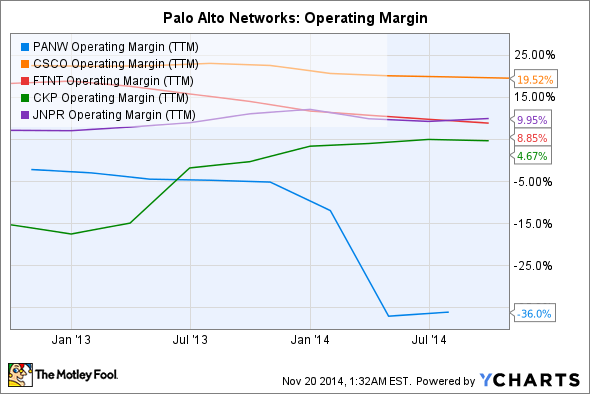 When we compare Palo Alto's operating margin to its peers', it's clear the company cannot win a prolonged battle. Another issue is that Palo Alto's convertible bonds, issued in June, can be converted to equity if its stock price hits $110 (it's just over $107 as of Thursday morning). That could increase the company's share count by 5 million. When combined with stock-based compensation, that could dilute existing shares by 20%. Palo Alto had a great run in 2014, but the stock is getting a bit pricey at 77 times forward earnings. By comparison, Check Point only trades at 19 times forward earnings. Palo Alto's top-line growth is certainly more explosive than that of its competitors, but investors should remember that it's growing at a faster rate because it is a smaller company. As the cybersecurity market grows, larger competitors will flood the space with cheaper security bundles, making it harder for Palo Alto to effectively grow its top and bottom lines.